New World Primates are native to Central and South America, with most of them inhabiting the plush rain forest along the Amazon. These include Squirrel Monkeys, Capuchins, Spider Monkeys, Howler Monkeys, Owl Monkeys, Marmosets and Tamarins. They are arboreal meaning that they spend their lives primarily in the tree tops and under the canopy of the rain forest. They are smaller than most Old World Monkey breeds, but are still remarkably strong in proportion to their size. Although they never lose their "wild" nature, with lots of patience, love and proper care, they can become amazing companion animals. Marmosets and Tamarins are in the family Callitrichid and are both small (adult size approximately 12 inches and weight up to two pounds) New World monkeys. All of them are now considered endangered in their natural habitat which includes the lowlands and rainforests of Coastal South America. These little guys have mass appeal as pets because they are extremely adorable when small and are gregarious and intelligent way beyond their tiny size. In the wild they live in family groups of four to fifteen, with one dominant female and one dominant male. The dominant female secretes a pheromone that suppresses ovulation in other females of the group so only she gives birth. The other members of the group help raise the young and the father is the primary caregiver. They generally give birth to twins and the father carries the babies on his back giving them to the mother only when its time to feed. Though Tamarins tend to be a bit larger than Marmosets, the primary difference between the two is their dentition. the incisors of marmosets are enlarged so they are the same length as the canines, enabling them to gouge holes in trees to consume nutritious gums and saps. The canine teeth of Tamarins are longer than the incisors. Because of the elongated canines, they are classified as being the more dangerous of the two; however, my experience has been that a marmoset is far more likely to bite in the first place. When it comes to aggression, marmosets tend to more territorial and unpredictable. Tamarins and Marmosets that have been hand raised and are accustomed to being around people are quite fearless. Both have been known to attack intruders or people they just didn't like, family members or not. They have also been known to turn on their caregivers if they feel threatened. Small in size maybe, but they are no pushovers An uninhibited, aggressive bite by either, can inflict a deep, painful wound. As sweet-faced as they are, an adult callitrichid can be dangerous if not properly socialized and handled. If threatened, they go for eyes, ears and fingertips; places where they can inflict the most damage. Of the most common Callitrichid breeds available, the red handed tamarin is by far considered the most docile and friendly of the bunch. They are intelligent and social and seem to love the company of people. I would describe capuchin monkeys as small to medium...about the same size as a cat, weighing in at a range of 3-9 pounds The fur of the capuchin monkey varies, but is most commonly seen with cream or light tan coloring around the face, neck and shoulders. The rest of its coat is dark brown. The hair is shorter and darker on the capuchin's back than on other parts of its body. The face of this cute monkey will range from white to pink in color. The tail is long, covered in hair and is partially able to wrap around branches. The exact range of their natural habitat isn't known but they are commonly found in Brazil and other parts of Latin America. Capuchin monkeys usually live in large groups (10-30 individuals) within the forest.They communicate with each other using a wide range of vocalizations. Capuchins can jump up to nine feet and they use this mode of transport to get from one tree to another. They sleep on tree branches and descend to the ground only to find drinking water. 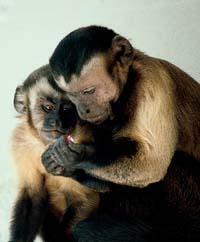 In the wild, a typical diet for Capuchin monkeys includes fruit, insects, leaves and small birds. They are particularly good at catching frogs and cracking nuts. They have also been known to feed on small mammals like mice and are skilled hunters. Capuchins are exceptionally intelligent and easy to train, which is why they are used most frequently as "helping hands" monkeys. They are also very social, which is why they are so popular as a companions. Their comical antics make them interesting and fun to observe. To date, the loss of the forest has not negatively impacted the Capuchin monkey populations as much as many other species as they seem to easily adapt to having humans nearby. Natural predators include jaguars and large birds of prey. 1. It is never a good idea to mix breeds of monkeys. They will not get along with other New World Monkeys as adults. Don't be fooled by pictures of Capuchins cuddling a marmoset or tamarin. Photo ops like that are not done with adult monkeys and have no basis in reality. As adults they will fight and likely inflict severe or even fatal wounds on one another. In nature these species do not inhabit the same space. If breeders tell you they get along fine, ask why they have them all in separate cages. 2. If after researching you decide to get a Capuchin, as a companion do get a female. Males are far more aggressive and prone to seek a dominating position within the household. Neutering will NOT change this agressive behavior in the least. There are people with male Capuchins, but they are experienced, knowledgabe monkey owners with strong, alpha personalities and not one of them would recommend a male as a first monkey. If a breeder tells you different, trust they are either trying to make a sale or are clueless. 3. Do your homework. Speak with experienced owners about care and interaction. You don't have a lot of opportunity for do-overs. Have diapers and vets and caging at the ready and be prepared to rearrange your life for the next twenty or so years! The spider monkeys got their name because of their striking resemblance to a large spider while hanging by their tails, their, slender body and disproportionately long, gangly limbs and narrow hands swaying in the treetops. Spider monkeys are highly agile, and they are said to be second only to the gibbons in this respect. Their hair tends to be coarse, long and stringy, lacking undercoat and ranging in color from ruddy gold to brown and black; the hands and feet are usually black. Heads are small with hairless faces, and a prominent muzzle. Some have flesh colored rings around their eyes and white chin whiskers. Like other New World monkeys, thumbs are not opposable and The nostrils are very far apart, which is a distinguishing feature of spider monkeys. These monkeys depend highly on their keen binocular vision. This arboreal monkey has a long and deftly prehensile tail that is muscular and tactile and is used as an extra hand. Both the underside and tip of the tail are used for climbing and grasping and has ridges similar to fingerprints. When swinging by the tail, the hands are free to gather food. It has hooked-shaped hands with long narrow palms and long curved fingers. Thumbs are either absent or reduced to a stump, but interestingly, they have thumbs on their feet. Spider monkeys are among the largest New World monkeys; Black-headed Spider Monkeys, the largest spider monkey, have an average weight of 10.8 kg (24 lb) for males and 9.66 kg (21.3 lb) for females. When the monkey walks, its arms practically drag on the ground. Unlike many monkeys, they do not use their arms for balance when walking, instead relying on their tail. Also less common in primates, females rather than males disperse at puberty to join new groups. Males tend to stick together for their whole life. Hence males in a group are more likely to be related and have closer bonds than females. The strongest social bonds are formed between females and young offspring. Spider monkeys are diurnal and spend the night sleeping in carefully selected trees. Groups are thought to be directed by a lead female who is responsible for planning an efficient feeding route each day. If she cannot find enough food for the group, it splits into smaller groups to find food more efficiently. This social structure ('fission-fusion') is found in only two other primate species, the Chimpanzee and Homo Sapiens. The size of subgroups (generally four to nine animals) and the degree to which they avoid each other during the day depends on food competition and the risk of predation. Grooming, normally an important aspect of new world monkey social interaction, is not as important to spiders owing perhaps to a lack of thumbs. 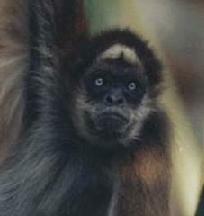 At 107 grams, the spider monkey brain is twice the size of a howler monkey brain of equivalent body size; this is thought to be a result of the spider monkeys' complex social system and their frugivorous diet, which consists primarily of ripe fruit from a wide variety (over 150 species) of plants. This requires the monkeys to remember when and where fruit can be found. The slow development may also play a role: the monkeys may live 20 years or more, and females give birth once every 3 to 4 years. The female chooses a male from her group with whom to mate. Both males and females sniff their mates to check their readiness for copulation.The gestation period ranges from 226 to 232 days. Each female bears only one offspring on average, every 3 to 4 years. Until age six to ten months, infants rely completely on their mother Males are not involved in raising the offspring. A mother carries her infant around her belly for the first month after birth. After this she carries it on her lower back. The infant wraps its tail around its mother's and tightly grabs her midsection. Mothers are very protective of their young and are generally attentive mothers. They have been seen grabbing their young and putting them on their backs for protection and to help them navigate from tree to tree. They help the more independent young to cross by pulling branches closer together. Mothers also groom their young. Spider monkeys live in evergreen rain forests, semi deciduous and mangrove forests, lowland rain forests to mountain forests. They live mostly in the upper canopy, preferring undisturbed high forest, almost never coming to the ground. Spider monkeys are frugivores requiring a diet of 90% fruit and seeds, feeding on the mature soft parts of a wide variety of fruits in which the seeds are swallowed along with the fruit. They also eat young leaves, flowers, aerial roots, sometimes bark and decaying wood, as well as honey. A very small part of the diet consists of insects, insect larvae and an occasional bird eggs. When feeding, they may hang by their tails and reach out for tidbits with their hands. They can also pick up things with their tails. They eat large quantities of food over a relatively short period of time and they tend to feed by suspension while hanging, climbing or moving. They do not pick fruit and carry it to another location to be eaten. In the Zoo they are fed celery, bananas, raisins, apples, oranges, carrots, monkey chow, dog chow, lettuce, and whole wheat/nut bread. They have minimal protein requirements compared to other new world monkeys. Considered good to eat and because of their large body size, spider monkeys have been severely hunted throughout their range. They are easy to locate because they are noisy and travel in big groups, so spider monkeys are often nearly extinct in areas easily accessible to people. They are also affected by habitat destruction, particularly logging, which removes the tall trees that they depend upon, as well as a lucrative pet trade. Low maturation and reproduction rates. also make them vulnerable. Their expected lifespan in the wild is about 27 years. NOTE: People that have spider monkeys as companions say that they are highly intelligent and social seeming to enjoy the company of people. They have a need for vertical space and simply will do not thrive if caged or confined. Large outdoor enclosures and play areas are highly recommended where they can play in the sunshine and burn off energy. They are said to highly affectionate and bond closely to immediate family and household pets that are tolerant of a little bit of "monkey" play. Constantly curious and keenly aware of their surroundings, they require a great deal of care, enrichment and interaction to do well in a home setting. Their intellect and emotional needs require full time dedication and a solid grasp on non-human primate behavior. If you are interested in obtaining a Spider Monkey as a companion, please contact me and I can arrange to have you speak with dedicated owners that can give you guidance. 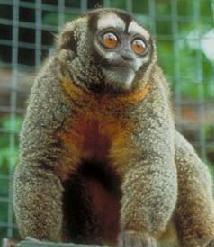 Owl monkeys have gray-tan to brown bodies and either gray or red fur on the sides of their necks. Their coats range in thickness and length depending on the altitudes at which they are found, with species living at higher elevations having thicker, shaggier coats than those living at sea level. They have pale yellow to orange fur on their stomachs, underarms, and inner legs, light gray to white markings above and below their eyes, and three conspicuous, black stripes from the top of their head to either side of each eye and straight down the forehead between the eyes to the bridge of the nose. These patches may create an illusion of alertness even when eyes are closed. The throat and sides of the neck vary in color from gray in the northern species to red in the southern species. Their non-prehensile tail is nearly as long as their body, with varying amounts of black at the tip. Ears are small, and difficult to see (Aotus actually means "earless"). Their long, thin digits have straight nails and wide fingertip pads. 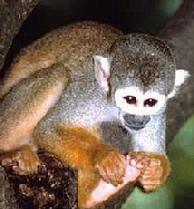 Two toes posses curved nails, which may be grooming nails similar to those found in prosimians. They are quadrupedal (walking and leaping) and arboreal (tree dwelling), and their tail acts as a counter balance as they move through the trees. The average weight for a male at about two and a half to three pounds with the females weighing only slightly less. Though owl monkeys are sympatric (sharing space) with other primates that use similar resources, they do not compete because of their alternative schedules. Furthermore, non-primate nocturnal competitors are usually small-bodied (like bats) or forage alone or in pairs, not posing significant competition. Nocturnal predators do not usually eat monkeys, but some potential threats include owls, snakes, and felids (wild cats). They sleep in tree holes and vine tangles, choosing concealed sleeping spots due both to the threat of predators and proximity to food sources. Diurnal birds of prey can pose a threat to owl monkeys if they are not well hidden in their sleeping sites. The maximum documented longevity for a captive owl monkey is 20 years. Despite being the most widely distributed of the new world monkeys, ranging from Panama to Argentina. their survival is threatened by habitat loss, hunting, and capture for use in pharmaceutical research. Howlers are New World monkeys found in tropical Central and South America. These highly social primates live high in the trees (the canopy) of the rain forests of southern Brazil, northern Argentina, Paraguay, Costa Rica and Bolivia. They are aptly named for their, loud, distinctive cries. They are not only the loudest monkey, but also the loudest known land animal. They only call louder than that of a Howler Monkey is the song of the Blue Whale. When a number of howlers let loose their lungs in concert, often at dawn or dusk, their "concert" can easily be heard up to three miles away. Male monkeys have large throats and specialized, shell-like vocal chambers that help to turn up the volume on their distinctive call. The noise serves as a homing beacon to members of the troop as they hunt and also sends a clear message to all other monkeys: "This territory is occupied." These vocal primates are far and away largest of all the New World monkeys weighing from 14 to 22 pounds and measuring from 22 to 36 inches in length. Howlers like other New World species have wide, side-opening nostrils. They do boast a strong, prehensile tail they can use as an extra arm to grip or even hang from branches No Old World monkeys have such a tail. A gripping tail is particularly helpful to howler monkeys because they rarely descend to the ground. They prefer to stay aloft, in their arboreal (tree top) habitat and can be quite difficult to see from the ground. 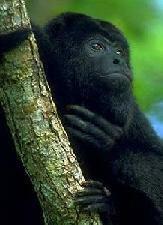 Howler monkeys are classified as omnivores but are primarily vegetarians. They do snack on the occasional maggot or beetle, but do not typically hunt prey for food much preferring the flowers, sweet fruits and tender leaves readily available in their tree-top habitat. Howler monkeys are stoutly built and have beards and long, thick hair, which may be black, brown, or red depending on the species. The females are brown to better serve as camouflage from predators. The red howler species (Alouatta seniculus) is the most common but is heavily targeted by hunters eager for bush meat. They are also captured for the pet trade further depleting their numbers. Howlers reach sexual maturity at approximately four years of age. They have a gestation period of 180 days and typically give birth to only one offspring. Their mating habits are non seasonal. They live in small family groups (troops) of 12 to 15 individuals with one dominant male and have a lifespan of 20 to 25 years. Infants cling to their mother's stomach for the first few months for heat and for protection from predators such as harpy eagles, raptors and other large birds of prey. Compared to other monkeys, Howler Monkeys don't travel very much. They are diurnal (active during the day) and seem relatively inactive, sleeping up to 15 hours a day and covering only up to a quarter of a mile of space. They are also slow moving and prefer basking in the sun to more strenuous activity. They also tend to stay within their small communities, making them all the more susceptible to habitat destruction. Within Belize, a special community based conservation organization has protected land along the Belize River for the Howler, ensuring that their food trees are not destroyed to make way for pasture. Due to loss of habitat, other species of howler monkey may be critically endangered over sections of their respective ranges. Tragically, some scientists estimate that some species of Howler Monkey could very well become extinct in our lifetime. The Alouatta genus is one of several within the family Atelidae, which also includes woolly monkeys, spider monkeys, and woolly spider monkeys. All are found only in the Western Hemisphere. "There are no wild animals until man makes them so." 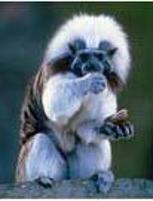 Old World Monkeys are native to Continental Asia and Africa and include Colobus, Macaques, Guenons, and Patas. These primates are on the ground as much as in the trees in their search for food and their territorial range can extend for several miles. They are much larger and possess greater physical strength than their New World cousins. This category of monkeys also include large apes, chimpanzees and orangutans. While I am fully aware that there are people that choose to house Old World Monkeys as pets, I personally believe their need for space and their extremely complex social structure make them inappropriate companion animals under all but the most specialized circumstances. Not only are they extremely intelligent, but they can possess the strength of several grown men and are often aggressive and dangerous as adults. While I don't wish to offend owners of Old World Primates in any way, I also need to express concern for their continued breeding for the commercial pet trade. I've volunteered my time at primate sanctuaries and can attest to the fact that they are at beyond capacity to continue taking in these amazingly precious animals because people were duped into thinking they would be the exception to the rule. They are wild animals....period. Pulling their teeth, filing down their nails, restraining them with harnesses or chaining them in enclosures may fool someone into thinking they have now tamed this formidable creature, but nothing could be further from the truth. At some point does logic dictate that an animal so powerful it needs a steel reinforced cage to be contained....simply wasn't meant to be contained? While I hesitate to speak in generalities, please consider it a given that the decision to house an Old World Primate is just not likely to have a happy ending. Any exceptions are so few and far between that for the sake of this discussion they have little relevance. If you feel I'm misguided, feel free to contact me and I'll direct you to one of the sanctuaries I'm familiar with. You can go there and look into the vacant eyes of an animal that has no concept of what he was meant to be. Accustomed to being treated "human" and with deep emotional attachment to his caregiver, suddenly upon reaching sexual maturity his behavior, aggressiveness and natural tendency to establish familial hierarchy becomes unacceptable. His wild instincts make him dangerous and he no longer identifies with his human caregiver. Suddenly he is confused and lonely, homeless and barely able to integrate peacefully with members of his own species. This heart wrenching scenario repeats itself day after day. I love these monkeys enough to know that they should be running freely, untethered, in wide open spaces with their own kind, mating, raising their young, squabbling and joyously swinging from trees. They simply are not house pets! The dedication of time, extreme financial commitment (adequate outdoor enclosures can cost thousands of dollars) and knowledge needed to adequately care for these precious monkeys is not something everyone can provide, regardless of desire and good intentions. If after careful consideration, you feel compelled to take an Old World Monkey as a companion, please talk at length with owners that have experience. Please, do not trust brokers with thousands of dollars at stake. Do not trust breeders that house them in cages to be a valid source of guidance. When you are ready to speak with experienced Old World Monkey owners, please contact me and I will put you in touch with the best. Everyone of them have dedicated their lives to caring for Old World monkeys and know what lies in the road ahead. If you sincerely do love monkeys, allow them to give you the guidance you need before making this life-altering decision. "Those who wish to pet wild animals love them. but those who respect their natures and wish them normal lives, love them more."